The ETP Enterprise Application Server (EAS) performs the role of a central server at the head office. The EAS database holds the consolidated data of the retail stores; sales, payments, inventory, employees, prices, promotions, customers, etc. This facilitates the exchange of transactional information amongst different store servers. It also provides the function to centrally create and manage key master information. 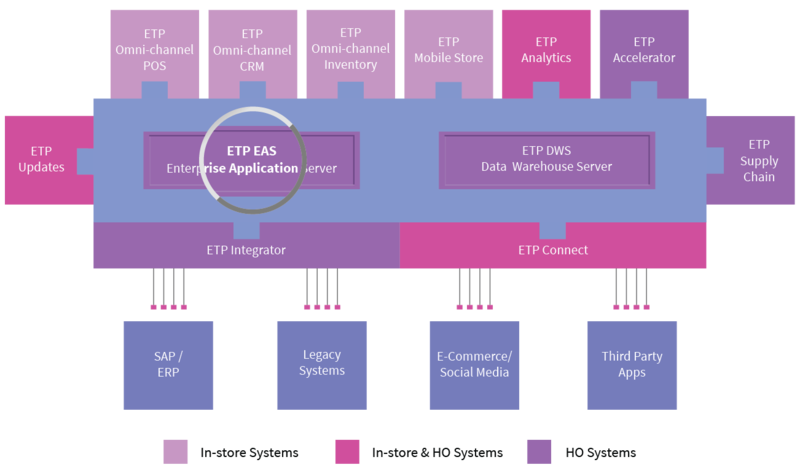 ETP EAS is capable of working in a multi-tier environment which facilitates scalability. The enterprise application server management features consolidated reports at the head office, centralized control, increased security and maintains ‘one version of the truth’.